The first mention of Burbage is in 1043, when Leofric of Mercia and his wife Gydgifu (better known as Godiva) founded the Abbey of St. Mary at Coventry. They endowed the new abbey with about thirty manors, of which three were the adjacent Manors Aston, Burbage and Sketchley. In 1095, the Abbot died, and before another could be elected the Bishop of Chester (Roger of Limes) took illegal possession of the Abbey and its manors. During the resultant lawsuit, help was given to the Bishop of Coventry by the knight Robert de Flamville and he was rewarded in 1100 by the gift of the three adjacent manors. Robert de Flamville had no sons and his name survives only in the suffix which he added to the name of the manor of Aston. His heir was his niece who married into the Hastings family. The direct line of the Hastings family died out in 1374, but the title was revived in 1416 in favour of Robert de Grey, who held the Manor at Burbage, was given the title Lord of Hastings. The Grey family remained Lords of the Manor until the abolition of manorial rights in 1935. 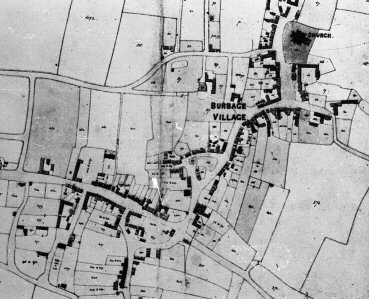 In 1564 the diocesan returns show a population of 57 families within Burbage and 6 at Sketchley. Burbage, for many centuries a small farming community, remained very thinly populated. In the census of 1801 there were 1098 inhabitants. It was not until the twentieth century that the population in exceed 2000. By 1953, the population had risen to 3.983, whilst in 1958 there was more than 5,000 on the electoral role, this rapid growth is largely due to the expansion of Sketchley Hill housing estates. Today the population of Burbage stands at over 17500 and continue to grow with development of more new housing estates on both brown and greenfield sites. Copyright © 2008 Burbage Heritage Group All rights reserved.